​Supporting unattended and lights-out running, the EasyBox systems are designed to allow components to be clamped manually onto pallets, automatically loaded into store and subsequently retrieved for robotic transfer into and out of 3-, 4- and 5-axis prismatic metalcutting machines (video: https://is.gd/dixiga). Hailed as competitively priced, the cells are manufactured by French firm Engineering Data at its production plant in Fondettes, near Tours, some 80 miles east of Nantes. The modular handling systems, which feature easy access for maintenance, are said to increase production output from non-pallet-change machining centres by up to 50%. The control software and touchscreen graphical user interface, which can be operated wirelessly from a tablet, are especially easy to use and allow deskilling of the machine loading function. Half a day’s training is all that is needed for an operator to become conversant with a system. Noel Boumediene started Engineering Data 27 years ago to design and manufacture special fixtures, mainly hydraulically actuated and with the accent on complex turnkey workholding solutions. They are used widely in the automotive and aerospace sectors, as well as in the rail industry and general engineering. In 2012, the company introduced robotic loading and unloading of components and the initiative quickly mushroomed into the production of different automated pallet handling cells, under the trade name EasyBox. There are already dozens of installations in factories across France and elsewhere (see later). The first model, L80, appeared on the market in 2015. It has a linear-rail-mounted robot capable of feeding up to six machining centres with workpieces of 80 kg maximum weight. There are now five styles of EasyBox cell, including a version with rotary robot motion for feeding one or two machining centres. Maximum handling capacities range from 250 kg down to 30 kg. They are all based on standard equipment that is customised with workpiece handling and clamping to suit each user’s specific needs, leveraging the long experience of Engineering Data in this area. Quick-acting SMED (single-minute exchange of die) tools integrated into Engineering Data’s own EasyLock modular zero-point clamping systems allow rapid repositioning to within 5 microns. EasyClamp self-centring vices are also available. 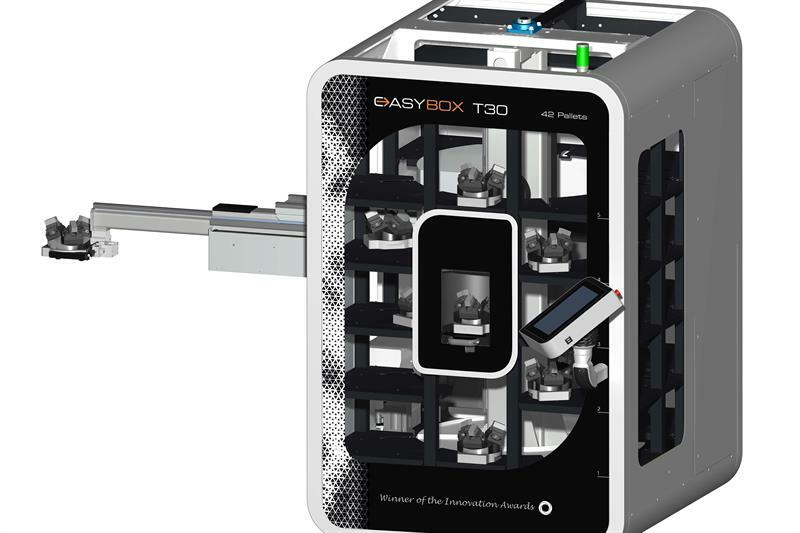 A recent product introduction was the EasyBox T30, which was launched in the UK on the 1st MTA (https://is.gd/wexohi) stand at the MACH machine tool exhibition in April 2018. It is a compact system with a footprint of just 2 m2 that can be configured to feed a machine from the left, right or front. Two versions are available, one each for 42 or 64 pallets. A 3-axis robot operates and is capable of handling components up to 200 by 200 by 180 mm and a maximum load of 30 kg including workpiece, fixture and pallet. The single load/unload station is positioned at an ergonomic height at the front of the store for convenient workpiece clamping and unclamping. The adjacent touchscreen panel for operating the robot is easily interfaced with all major types of machine tool control, including Heidenhain, Siemens, FANUC and Mazatrol. Most recently, an EasyBox T100 was introduced that has a 5 m2 footprint, a storage capacity of 32 pallets and a maximum load capacity of 100 kg. One French company that has invested in EasyBox technology is SAH Leduc, which designs and manufactures nearly a quarter of a million custom-made hydraulic cylinders annually, running 24 hours a day, at a 27,000 m2 factory 12.5 miles from Nantes. 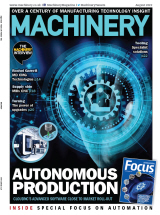 To keep production in France while remaining competitive, the company turned to Engineering Data to increase the productivity of its machining centres. Thierry Hervy, industrial and production manager, explains: “Our single-acting, double-acting and telescopic cylinders are diverse, because they are found almost everywhere, on mobile machinery in particular. “Our engineering team uses CATIA CAD systems to design the products and then finite element analysis and fluid dynamics calculations to optimise them. They come in all sizes up to a maximum stroke of seven metres and with a diameter of up to 250 mm. He explains that previously the machining centres in the factory were underutilised and therefore inefficient, due to spindle idle time during workpiece loading and unloading. Additionally, the operator had to be in attendance for most of the time. When a new 5-axis machining centre was installed, the company opted for an EasyBox L80 system, with SAH Leduc gaining four extra hours of production every night, leading to a return on investment that Hervy estimates will be less than five years. He continues: “After the rapid development phase and start-up was completed, the automation significantly reduced the number of man-hours required for production and the productivity gain is very important. Workholding devices specific to SAH Leduc’s production were also developed and manufactured by Engineering Data. Patricia Bouger, sales manager at Engineering Data comments: “Our strength is not only to bring an automated solution for loading and unloading machining centres that is accessible to all and whose rapid installation on site does not disrupt the workshop, but also to propose a solution that encompasses positioning, clamping and supervision of parts.